A group of alien leaders has gathered on Planet New Tekino where a chemist has made a discovery on the northern shore of Torba Island. But what did he discover? I waited at the Torba Island Interplanetary Spaceport in Brakva City, Torba Island, Planet New Tekino. I was the President of the New Tekino Federation which was the 3rd planet in the Karushian System. My people had colonised this planet in 1863 AD. We are a hominine race that evolved on Planet Karusha. New Tekino was about 5,673 kilomitres in diameter with a large continent centred around the south pole and a series of four islands in the north. Torba was the second of four islands. New Tekino was known to have the highest number of elements in the galaxy. I stood on the tarmac under the shelter as it was howling down with rain and the wind was strong, the leaves blowing in the gale. It was five in the afternoon. I looked up as I spotted the first of the three alien visitors that I had expected. It was the Anastanian spacecraft which had first arrived. It was a metallic silver colour with a sharp pointy nose and streamlined wings that were slanted back. The engines grew louder as it landed on the tarmac by vertical landing, the flames shooting underneath. Once the spacecraft had landed, the engines wound down. The ramp of the spacecraft came down and an elderly hominine female walked down the ramp towards me. I walked up to her and said "Hello, my Imperial Matriarch. How are you?" "I'm fine thanks, Myakalin" she replied. Her name was Imperial Matriarch Borhan Yaghan of Anastania. She had long grey hair and a medium build and wore a purple and light blue floral dress. "Lewis Hanson of New Zealand has married the Provincial Matriarch of the Vali Continent". The second alien spacecraft had arrived from Planet Kajini in the Kajini System. It was a white spacecraft with a red stripe round the sides and its wings raised up. It landed to my left. The door opened up and a humanoid dragon with wings and green skin walked down the ramp towards me. "Hello, Secretary General Dadunka Avalu," I said "Welcome to New Tekino". "Hi" he said. His eyes were yellow and he wore a crimson top with purple paints, white socks and black leather pants. "Where's your secretary general?" "He's taking Vivien Leigh and Toby Maddison of Earth sailing on Lake Tequalla". "That's a mighty big lake," said the Imperial Matriarch "Must be about a third of Karusha's surface". "You can say that," I said "About fourteen thousand kilometres long and five thousand kilometres wide. The biggest lake in the galaxy. Oh, must be our third visitor I believe". We looked up at the sky as a sky blue space craft from Planet Nefedo came towards us and landed next to the Kajinese spacecraft. It had a sphere at the front and a rectangular body. As the spacecraft opened up, a humanoid female with a metallic exoskeleton came down the ramp. "Good," replied Gunra "Andrew Scot of America is dating my daughter". "I don't blame him," said Dadunka "She is pretty". "Thanks" said Gunra. The Nefedins resembled humanoid robots but were in fact living organisms. "Shall we head to the conference?" I said "Doctor Gelegra is about to reveal his great discovery. It should be exciting". I smiled. "The others would be waiting". "OK" said the Imperial Matriarch with a smile. We walked across the tarmac, through the main terminal building towards the front entrance where a metallic silver limousine waited for us. The chauffeur opened up the back door. We climbed into the back of the limousine. Then the chauffeur closed the door behind us and walked around to the driver's seat. After he climbed into the driver's seat, he started the engine and we were off. We headed down the driveway of the space port and went through the countryside which was covered in temperate forest. The trees were green and it was pouring down. "So you have 226 elements in the periodic table I believe?" said Gunra. "Yeah," I said with a smile. "We discovered efurion in the south pole a few years back. It is the heaviest noble gas ever discovered". We went through the residential part of the city until we came to Torba Island University. We went up the driveway, through the buildings until we reached the entrance to the Torba Island University Institute of Chemistry. The concierge opened the back of our limousine and we climbed out. We walked up towards the entrance of the Institute of Chemistry where a hominine and a Minotaur waited for us. "Ah, Secretary General Falusa Kaha, Secretary General Abeqa Laqa" I said. I introduced them to the Imperial Matriarch, Dadunka and Gunra. "Nice to meet you" said Secretary General Falusa of Barasil and Soghanis. He came from the Barasil Soghanis twin planets. Although his people had evolved on Planet Barasil, Falusa was a native of Planet Soghanis. "It is a pleasure meeting you" said Secretary General Abeqa of Planet Muracis. He was a Minotaur which was a humanoid with a head of a bull. He had a strong chest, brown fur and hooves. "Let's get into the foyer out of the rain" I said. I led them into the foyer of the Great Hall of the Institute of Chemistry. The carpet was bright red, the walls pale yellow and the ceiling made of gold. "There's my man" I said as I spotted Doctor Gelegra Maduk walking into the foyer with a humanoid and a woman. "Doctor Gelegra, come this way". I waved him over. "President Myakalin. So glad you can make it" he said with a smile. Gelegra was in his late twenties with wild, black, bushy hair and wore a white lab coat with black jeans and black boots. I introduced him to the Imperial Matriarch, Dadunka and Gunra. "And this is Secretary General Dalhingra Jarvorta of Planet Segaria and Secretary General Lisa Gyne from Earth" I said. The Segarians were a race of humanoids that could shoot electricity from the palm of their hands. Dalhingra was in his mid fifties with grey hair and a strong build. Lisa Gyne was in her late thirties with long black hair and medium build. She wore a white and orchid floral shirt, denim skirt and black boots. "Nice to meet you," said Lisa "So nice to be on this beautiful island". She had a beautiful smile and spoke with a Swiss accent. "Now that everyone is here," announced Gelegra "If you would all pile into the auditorium. There is something I would like to announce. You'll find it interesting". We all complied. We followed Gelegra into the main hall of the Institute of Chemistry and sat down on our seats as Gelegra climbed up onto the stage where had placed large black clothes over a series of boxes. Once we had all settled in, Gelegra began his seminar. "After we had collected some these rocks, we took them back to the laboratory and put them into an electroplating bath. And this is what we isolated. 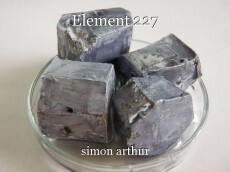 May I introduce to you element number 227". He grabbed another black cloth draped over a glass box and pulled it off revealing a silvery metal that was covered in paraffin oil. Everybody gasped at the sight of it. "We have named this element Trumpekia, in honour of Donald J. Trump who was the President of the United States from 2016 to 2024". "Trumpekia has two hundred and twenty seven protons, two hundred and twenty seven electrons and an atomic weight of four hundred and forty nine. After analyzing this magnificent element, we had placed it under hydrogen, lithium, sodium, potassium, rubidium, caesium, francium, kaleya and fetar in the periodic table. Thus making trumpekia an alkali metal. And like all alkali metals it has a single lone electron in its outer shell. "It's most stable isotopes are trumpekia 454, trumpekia 457, trumpekia 459 and trumpekia 463. Because it has a lone electron in it's outer shell, it wants to get rid of that electron to form a full outer shell. Hence we have to keep it covered in oil as it will react violently in oxygen". Gelegra took out a set of tweezers and a scalpel and carefully cut off a piece of trumpekia. "As you can see, trumpekia is as soft as cheese. We are now going to see what happens when we put trumpekia in water". Gelegra carried the trumpekia over to the plastic box of water and just chucked the trumpekia into the water. As soon as it hit the water there was a loud explosion with a flash of white light. I felt the shock wave go through my body as it shook the room. My heart beating faster as I felt it in my throat. I was not prepared. It gave me a massive fright. "By adding trumpekia to the water," explained Gelegra "You get trumpekia hydroxide plus hydrogen. After reacting the trumpekia with various chemicals we were able to make various compounds". Gelegra grabbed another black cloth draped over some smaller containers as he named each compound. "The various compounds we have produced are trumpekia fluoride, trumpekia chloride, trumpekia bromide, trumpekia iodide, trumpekia actinide, trumpekia tessinide, trumpekia zoride and trumpekia zehanide. "We have also produced trumpekia sulphate, trumpekia oxide, trumpekia phosphate and trumpekia nitrate as well as trumpekia nesernate and trumpekia diarnate". We were amazed at the range of compounds that Gelegra produced with trumpekia. I could not believe it. "So we have all these compounds produced from trumpekia. And that's about it. You are quite welcome to come and have a look at trumpekia and its compound. But don't touch the trumpekia as it is highly radioactive and it can severely burn you. That's about all". I stood up and said "Give it up for Gelegra!" Everybody stood up and clapped as Gelegra bowed to us. After we had finished clapping, we walked onto the stage and looked at trumpekia and its compounds. The trumpekia had a shiny metallic look to it. "Such a beautiful alkali metal," said Gunra "So shiny". "Yes. And look at all it's salts" said Dadunka. The trumpekia salts ranged from orange to pale yellow to white. "All those different colours". He admired the different trumpekia salts. Fine powdery stuff with a range of colours. Then we looked at the trumpekia sulphate, trumpekia phosphate, trumpekia oxide and trumpekia nitrate which ranged from sky blue to lavender purple. "I can't believe it," said Falusa "All those different trumpekia compounds. It's amazing the range of colours". "Look at the rocks," said Abeqa "They look orange though". We looked at the trumpekia ore which was covered in orange with some purple and blue on it. "As you can see," said Gelegra "The rock is mostly covered in trumpekia oxide with a bit of trumpekia cyanide and trumpekia chloride. That yellow patch is trumpekia sulphate". "Can't believe you now have two hundred and twenty seven elements in the periodic table now," said the Imperial Matriarch. "How many rows are we up to now?" She looked at Gelegra. "We have now started the tenth row in the periodic table" replied Gelegra. "Wow," said Dahlingra. "To Doctor Gelegra," he raised his glass of wine in the air "And his new discovery". © Copyright 2019 simon arthur. All rights reserved.